A new broadcast set to air on Adult Swim, the late night segment of the Cartoon Network, has drawn outrage from Christians because of its blasphemous depiction of Jesus as being a foul-mouthed, pot smoking hoodlum. Black Jesus is scheduled to air in August during the 11 p.m. time slot on the network, and is a half-hour comedy series produced by Peabody Award winner Aaron McGruder. 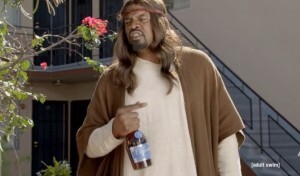 “The series finds Jesus living in present day Compton, CA on a daily mission to spread love and kindness throughout the neighborhood with the help of his small but loyal group of downtrodden followers,” a description of the broadcast from Adult Swim outlines. But a trailer for Black Jesus shows a sandal-clad robed man who represents the Messiah repeatedly using profanity, along with his disciples, who accuse him of smoking all the weed. “You do realize that I died for your [expletive] sins, right?” he replies. “That [expletive] is getting old,” one disciple complains. “Don’t you know that was 2014 years ago?” another asks. Christians across the country have been finding the comedy series less than humorous and are calling for the cancellation of the show. Both groups noted that the network seemed to only be targeting Christianity, and would not have dared to make a similar broadcast mocking Islam. Pastor David Rodgers of The House of Prayer for All Nations agreed. AFA and One Million Moms are likewise are urging Christians nationwide to contact Turner Broadcasting to demand the cancellation of the broadcast. Editor’s Note: Those wishing to express disapproval may sign American Family Association’s email letter here or One Million Mom’s correspondence here. A petition has also been created at Change.org.